As another “season” winds down here in the Windy City, Black Gate photog Chris Z and I once again find ourselves at one of the most interesting, yet largely unheralded shows of the year which has never failed to turn up some notable tales to tell. 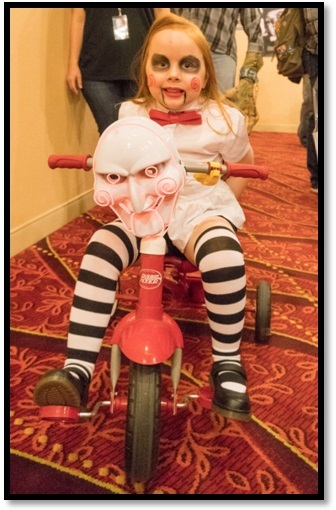 Days of the Dead is touted as a “by the fans, for the fans” convention which had its inaugural show in 2011, and which currently tours through Atlanta, Charlotte, Indy and Louisville, wrapping up the year here in Chicago in November. According to their site, the con’s primary goal is to bring back the idea of the genre convention being a welcoming communal gathering of like-minded friends and fans. Each event is tailored to the local audience with an active after-hours scene of horror themed parties, along with a robust guest list of celebrities, artists, and up and coming independent film makers. 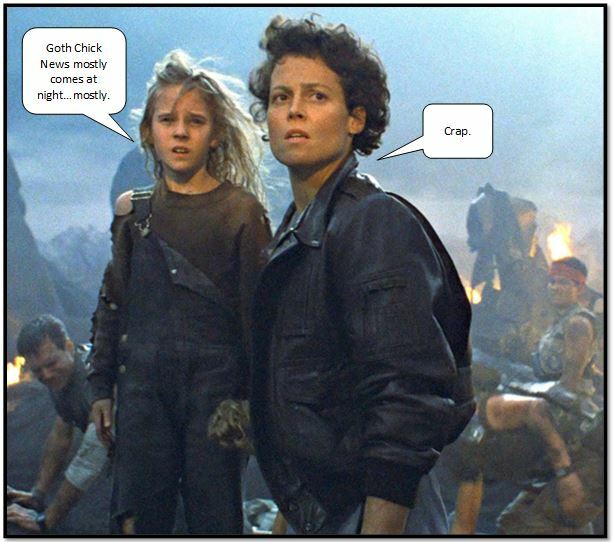 Which makes it a Goth Chick News perennial favorite. 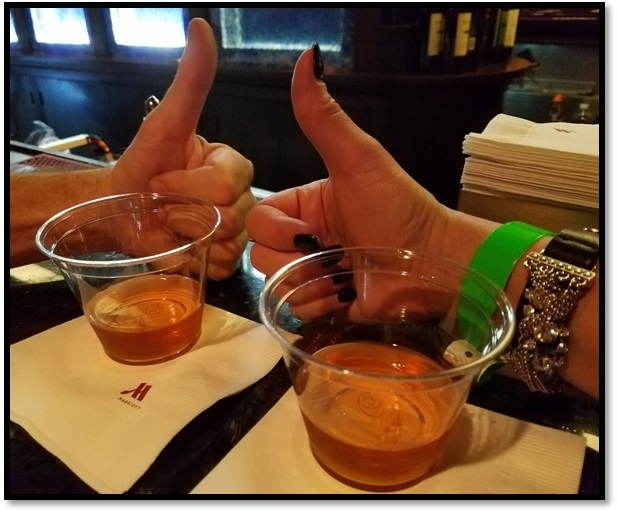 Forgiving the fact that the suburban hotel where the Chicago event is held, has a bar that doesn’t open until lunchtime – meaning our standard show Fireball shots have to wait until midday, Days of the Dead is smaller and more intimate than the mega-cons like C2E2 and ComicCon. This allows for actual conversation with the attendees without the crush of too many sweaty people in spandex. However, its size doesn’t stop it from attracting some very interesting celebrities. Past years have seen us chatting with the likes of Sid Haig (The Devil’s Rejects), Sandahl Berman (Conan the Barbarian), William Sanderson (Blade Runner) and Heather Donahue (The Blair Witch Project). Why you ask? Because they take (generally) the time to tell their fans something unexpected about themselves and the movies they appeared in, and they were happy to be there which some of the celebrities we have met along the way at various events definitely were not. Okay, we don’t know if Tara Reid was happy to be at DotD last year or not, since she didn’t appear from her “late lunch in her room” until we were leaving at the end of the day, so we won’t even speculate. But in general, the people that show up for DotD in Chicago in November are hearty, enthusiastic souls who we love talking to, and this year was no exception. My first fangirl moment of the day came when I met Carrie Henn who played “Newt” alongside Sigourney Weaver in James Cameron’s Aliens (1986). Some years back my excellent cyberstalking skills led me to Carrie who I have always wanted to talk to about her experience filming the movie at the tender age of nine. I tracked her down at the grade school where she teaches and sent her an email asking for an interview. Not to anyone’s surprise, I heard precisely nothing back. Though Chris Z begged me not to relay this “creeper story” to her when we met, I did it anyway and Carrie was fine with my stalker behavior and explained that the school where she works is quite protective of her and screens all her emails. She said it would have never reached her but graciously agreed to do an interview for Black Gate. In the mean time I had to ask her if, like Stanley Kubrick had with Danny Lloyd, James Cameron had kept Carrie from knowing she was appearing in a horror movie. Carrie explained that due to the scenes in which she appeared it would have been impossible to shield her from everything, so Cameron was very careful to explain everything to her in great detail and show her how everything worked. She also shared that Sigourney Weaver made a lot of jokes and kept things very light so Carrie never felt anxious about her scenes. And that is why I have the best job ever. We also had an interesting encounter with Lisa Marie whose name may not immediately ring any bells, but whose characters should. You may recognize her as “Vampira” in Ed Wood, or as Ichabod Crane’s mother in Sleepy Hollow. No? 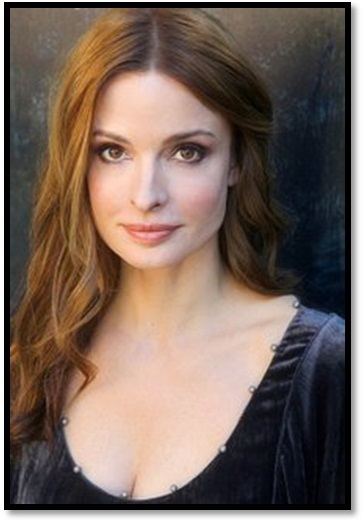 Then how about “Nova” in Planet of the Apes or the Martian girl in Mars Attacks? Well trust me when I say that as a huge fan of Tim Burton (Ed Wood, Sleepy Hallow), I was extremely interested to meet the woman who was engaged to him and who he referred to as his “muse” for the several years they were together. I mean, not only was she beautiful, but she must also be extremely artistic and inspiring right? Okay, well she was friendly if, well, a tad vague. 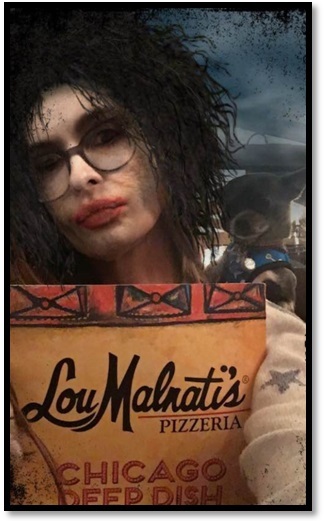 Lisa Marie was late to arrive down from her room (insert joke about partying with Tara Reid here) and when she did appear she was clutching a trembling Chihuahua under one arm and a small dog bed under the other. We waited patiently while she got the dog settled after which she turned to us and said “hi” but nothing else. As Chris Z could see I had more commentary in my head than I could possibly cope with at that moment, he stepped up and started bantering to her about her roles, her first visit to Chicago, etc, etc, to which Lisa Marie smiled vaguely and nodded. She did share a very short story about how the wig she wore in Mars Attacks gave her a permanent scar on her skull. I finally recovered enough to tell her how much it had meant to me to interview Martin Landau with whom she worked with in Ed Wood and how sad it was that he had passed earlier this year. But Lisa Marie was back to smiling and nodding. I decided bringing up Tim Burton would probably end badly, so I didn’t. Fangirl moment number two came while I was becoming acquainted with an indy film company Scotchworthy Productions. Turns out these guys are a Chicago-based independent movie production house and special FX design studio. They focus specifically on making realistic practical special effects which they are currently showcasing in an ambitious project called World of Death with none other than the premier horror site called Bloody Disgusting run by none other than my personal fangirl crush “Mr. Disgusting” himself, Brad Miska. 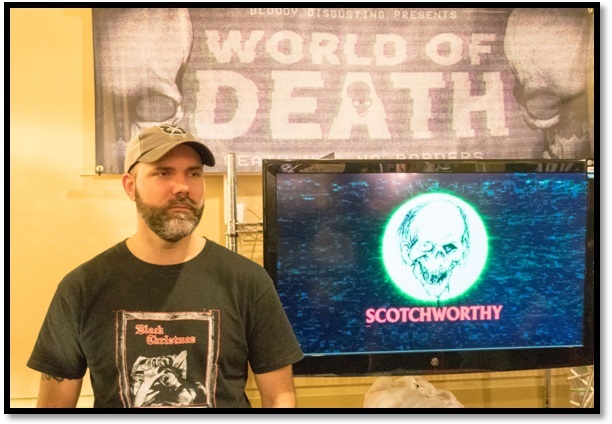 Though I was initially weirded out by World of Death thinking it might be a reincarnation of those gross, psudeo-snuff films from the 80’s, Faces of Death, I quickly learned it is a series of short films submitted by indy filmmakers from around the globe and produced by Scotchworthy Productions. Each week a new episode premiers at Bloody Disgusting and is compiled on the dedicated Youtube channel. At last count there were 134 short indy horror films available to view and the ones I peeped at the convention were amazingly good. As we here at GCN love nothing better than promoting the indy film scene, we’ll be getting in touch with Tony Wash, Scotworthy’s president, for a follow up interview soon. And what about Mr. Disgusting? Much to Chris Z’s dismay, I pulled out another stalkerish story with which to charm Brad Miska by telling him I once worked a day job alongside his Mom, which is what got me visiting the site in the first place. I mean, imagine a coworker introducing herself by telling you her son is Mr. Disgusting. It was too good to pass up. While Chris Z stood a safe distance away with a hand over his eyes, I had a wonderful chat that resulted in an exchange of business cards and a promise that Brad and I would “do something creative” together for our respective publications. With the celebrity sightings out of the way, we turned our attention to the vendor rooms. Though many of the stalls had return occupants whom I have already introduced you to in previous years, there were several new items to tell you about. A new graphic novel by Sourcepoint Press grabbed our attention. These are the same guys responsible for Holliston: Friendship is Tragic which we told you about last year. Their latest release, The Rot, tells the story of what happens when science meddles in the affairs of the supernatural. Dwight Cochran, former assassin, developed cancer in prison. After undergoing a secret procedure funded by the government that destroyed half of the prison, Dwight was reborn as The Rot. With the ability to use his cancer as weapon, he vowed to punish the wicked and protect the innocent… no matter where he finds either of them. Heaven can’t stop him. Hell is terrified of him. Man wants to use him. Unfortunately, for all of them, The Rot answers to no one. 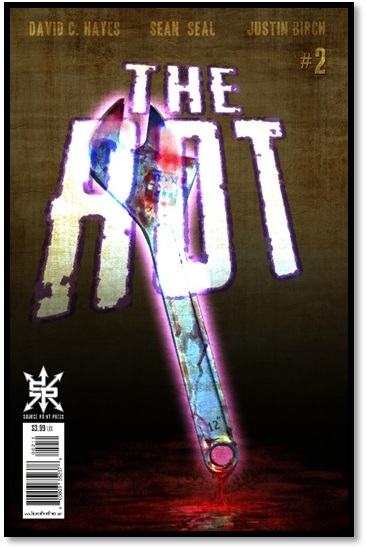 Currently on issue #2 which is about to be released, The Rot is available at Sourcepoints website or where fine comics are sold. We loved Becca Whitaker’s artwork which includes retro, pinup girl illustrations both of her own creation and by commission. Becca is a self-proclaimed pop culture junkie who someday hopes to be whisked away in the TARDIS by the 9th Doctor. She also felt compelled to tell us she highly approves of William Shatner’s singing career, adores Bettie Page and admires Isaac Asimov’s wit which was, again, interesting. Whitaker is also a staff artist for Bachelor Pad Magazine and has created logos and art for many modern-day pin-up girls. You can find her at her website or contact her via Instagram. Finally, prior to adjourning for our Fireball shot, we met “Lurkin” a host from The Vortexx; a 24/7 channel streaming horror hosts and movies since 2010. Specializing in b-movies and cult-flicks I imagined a combination of MST3K meets cable access and apparently, I’m not far off. You can watch them on their new Vortexx Roku channel or just stream it live here, which is what I’ve been doing in the background for the last couple of hours. Yes, its cheesy in the extreme and yes, I’m completely hooked. Have a question or comment? Post it here or drop a line to sue@blackgate.com. Lisa Marie was also in the very creepy, but little raved about, We Are Still Here.